Fourth-year Tyler Howard defends the ball from some tough defense. The Chicago team had a great weekend, winning back-to-back games in the UAA. 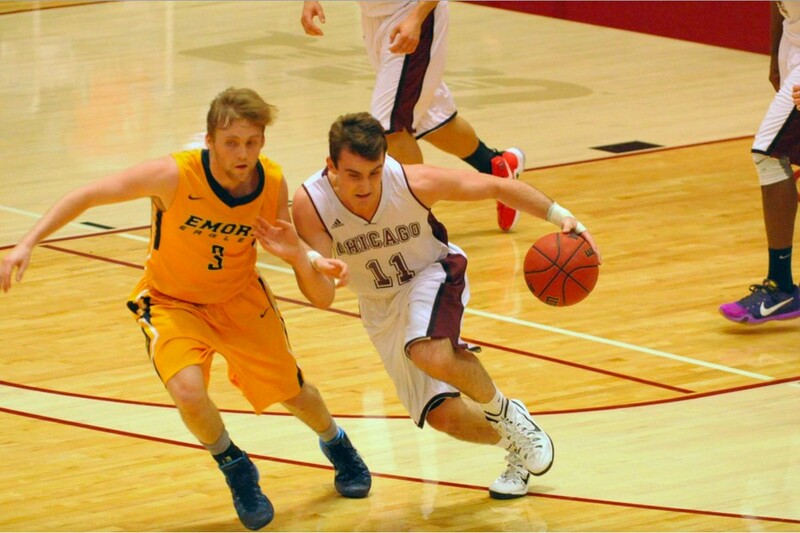 These are the first two conference wins for the Maroons this season, raising their record to 10–6 overall, 2–3 UAA. The wins came over Brandeis (6–9, 2–3 UAA) Friday night and NYU (6–9, 1–4 UAA) Sunday afternoon. After enduring a five-game losing streak that included multiple ranked opponents and losing the first three games in conference play, the Maroons got themselves back in the win column Friday night, beating the Brandeis Owls at home 75–65 during “Beach Night.” The fans came clad in traditional beach wear, from swimsuits to sunglasses, to cheer on the Maroons Friday night. UChicago jumped out to an early lead and stayed in control for most of the game. Brandeis had no answer as fourth-years Tyler Howard and Blaine Crawford and third-year Jake Fenlon all scored 16 points. The Judges tried various forms of man and zone defenses, staying aggressive all night. The Maroons took advantage of that aggression, getting to the foul line 30 times, making 19 of them. The win was even more impressive given the Maroons were short-handed, as second-year guard Noah Karras missed the game due to sickness. In the second game of the weekend, the Maroons took on the NYU Violets, dominating the game 93–79. Chicago dominated the boards 44–30, led by fourth-year center Blaine Crawford, who finished with nine. Crawford also rounded out his stat line with 17 points, nearly a double-double. Most importantly, 15 different Maroons logged minutes in the win, with no one person playing more than 30 minutes, which is very different from their norm. This season, only seven players are averaging more than 15 minutes per game. Fourth-year guard Waller Perez led the team with 24 points, while Howard led the team with seven assists. Perez started the game hot, scoring eight of the first 13 points for the Maroons, and never looked back. Fenlon, known for his precise shooting, complemented his 15 points with an impressive four blocks. Barthel added another 18 points in the complete team win. This style of basketball bodes well for Chicago, as the UAA schedule is particularly long, involving more than seven flights over the course of just eight weeks. The Maroons' next weekend includes two of those flights, as they head to Pittsburgh and Cleveland to take on Carnegie Mellon and Case Western Reserve.